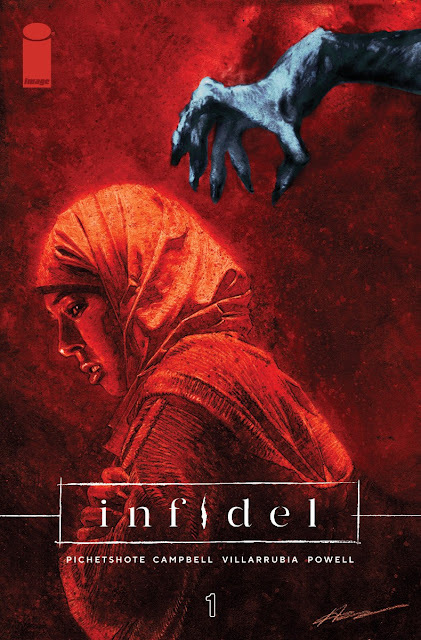 'Infidel' #1 by Pornsak Pichetshote and Aaron Campbell arrives at a time when the horrors of everyday life for marginalized people is scary enough but add misogyny and xenophobia from demons and well, that's just multi-dimensional haterade. This contemporary horror story feels timely and brimming with scary thrills. Aisha is an American Muslim woman who just moved into a haunted apartment building with her boyfriend, his child, and his mother. It's the perfect horror movie set-up that includes a tragic incident that led to the killing of several people, the haunting aftermath of the explosion, a boyfriend's xenophobic possibly racist mother, and terrifying nightmares. Pichetshote has cooked up a potent cauldron consisting of the right horror tropes mixed with equally horrifying real-life anxieties and prejudices. It's all one giant concoction of bone-chilling dread and heightened fear. The constant question is of course, as with any scary movie, " why don't they just move out?" Aisha believes this horrific dreams and images are just a manifestation of her anxieties and worries. Building an instant family is a lot to deal with. Can she be a good mother-figure to his daughter? Can she dispel his mother's anti-Muslim feelings? These are all legitimate issues that could weigh heavily on any person but it's compounded by the unprovoked fear and racism Aisha contends with on a daily basis. This adds resonance to the story as well as the question "Are supernatural monsters the worst things to fear when society views you as a foreigner in your country?" It's a tough call. Also, living in a big city can be super expensive so a discounted rate for a building that saw an explosion take out some amenities (and people) leaving behind some salty sexist spirits might be worth the risk. Aaron Campbell is a master of tension with a gritty style that soaks scenes in a menacing sheen. He's Pichetshote's director-cinematographer setting the tone with scratchy lines that invoke a looming terror around any and every corner, creating an atmosphere of suspense. When something lurks in the dark it can be chilling but when a monster appears, Campbell takes a full-frontal approach that shocks you in place. Jose Villarrubia colors most of it in subtle subdued almost weathered hues but the freaky apparitions take on a more realistic appearance with rich bolder colors. There's a heightened realism to the spirits that make them hauntingly threatening inducing goosebumps. 'Infidel' is a suspenseful exercise in addressing the demons that lurk in life and the afterlife. Pichetshote has created a great character in Aisha who is the Everywoman, making her way trying to be good person amid the dregs of society. She has a strength that keeps her positive even when faced with monsters, literal and otherwise. Campbell's art simmers with tension and fright. 'Infidel' is a modern horror story that cleverly blurs the lines between reality and the supernatural.